It has been a while since I posted anything. The car has been running great so not much to report. And I have a new project sucking up lots of my time. But I did do spring maintenance today. 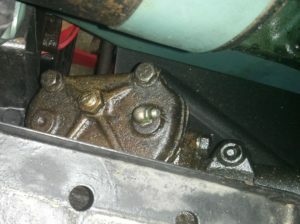 I have shown most of this before but I do have some new #0 grease for the steering box. This is a John Deere lubricant sold as “Corn Head Grease”. As you might expect it is green and very, very slimy. I cleaned out my least favorite grease gun to hold this stuff. Flushed and filled cooling system. I kinda screwed up here. I calculated the antifreeze quantity based on the capacity in the service manual. I forgot (again) that the heater is being bypassed. So my planned 50-50 mix is more like 70-30. Whups.